Photos, Data, and Commentary compliments of Jake Ensign. Compiled by Bowsite.com. 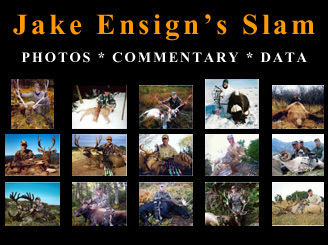 Few bowhunters have taken Archery's Slam (all 29 species of North American Game Animals) and even fewer have done it as efficiently as Jake Ensign. In this feature Jake shares this extremely difficult feat with Bowsite.com visitors as he chronicles the 30-year journey of his slam, commenting on every animal taken. His data includes the costs of each hunt, how many attempts he made for each animal, the level of difficulty he encountered, and photos of his trophy animal both in the field and in his home. Jake has a passion for archery rivaled only by a few, but it is his willingness to share honest, candid information that makes him one of Bowsite's most popular Visitors. Jake is also answer questions on this thread.